In the United States, about one out of eight women will develop invasive breast cancer over the course of her lifetime. Undergraduates working with Jenifer Prosperi, assistant professor of biochemistry and molecular biology at Indiana University School of Medicine-South Bend, seek to increase our understanding of underlying mechanisms of the process of breast cancer. Junior science preprofessional major, Katia Fernandez, is currently studying the response of breast cancer cells to chemotherapy, focusing on the APC tumor suppressor. “Chemotherapy resistance is a major problem in the management of patients with breast cancer, and many patients experience recurrence and ultimately die because of treatment failure. Emerging evidence suggest that some tumor cells can survive chemotherapy by activating the self-renewal pathways resulting in tumor proliferation and clinical recurrence,” Fernandez said. With the guidance of Prosperi, Fernandez is working on a research project that investigates the consequences of APC loss on the responsiveness of breast cancer cells to standard chemotherapeutic agents. The Prosperi lab works to identify therapeutic targets for breast cancer by using different model systems that imitate tumor proliferation and progression in order to investigate its effects and target new methods for treatment. “My personal goals in the lab include continuing to work on this project and submitting a manuscript for publication later this year. I will also be presenting this project in several meetings this semester: the annual American Association for Cancer Research (AACR) meeting, the Harper Cancer Research Institute Research Day, and the College of Science Joint Annual Meeting,” Fernandez said. Fernandez plays a critical role in Prosperi's research, but prior to working at the Harper Cancer Research Institute, she had no research experience outside of the classroom. During her freshmen year, she took a First Year of Studies seminar about research initiatives on campus, and was immediately drawn to Prosperi’s lab after learning about her work. “Since the moment I heard about the Harper Cancer Research Institute, I knew that I wanted to be involved in some type of cancer research there. I wanted to work in a research lab that focused on breast and ovarian cancer because my mother’s health was interrupted by both these cancers,” Fernandez said. After working as an undergraduate research assistant for two years, Fernandez plans to continue working in the Prosperi lab this summer and throughout her senior year. This summer, she plans to apply to M.D. and M.D./Ph.D. programs. “Prof. Prosperi actually introduced me to M.D./Ph.D. 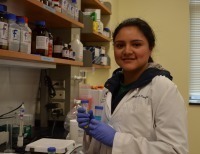 programs and through working in her lab for the past two years, I have actually chosen to pursue a career in cancer biology research and the oncology field of medicine,” Fernandez said. Originally published by Angela Cavalieri at harpercancer.nd.edu on March 07, 2014.